Why do we eat cheese on the Jewish Holiday Shavuot? Confession: I don’t know much about Shavuot. I do, however, know that I can get behind anything that celebrates cheese. Cheese is one of those guilty pleasures that I could eat all day long. Therefore, when a golden opportunity arises to have a non-stop dairy celebration, we all need to partake and honor the delicious goodness of cheese. When the Jewish people received the Torah on Shavuot, they were commanded to only eat meat that was ritually slaughtered. The Torah was given on Shabbat when it was forbidden to slaughter animals, forcing them to eat dairy for the rest of the holiday. The Gematria (numerical value) of the Hebrew word for milk (chalav) is 40, which corresponds to the 40 days and 40 nights that Moses spent on Mt. Sinai before bringing down the Torah. 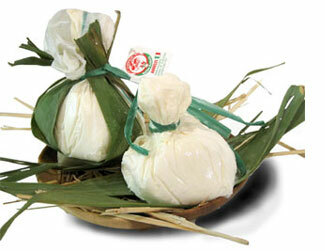 There is no better time than Shavuot to introduce a recent obsession of the Delicious Israel staff, burrata! Burrata is a fresh Italian cheese made up of mozzarella and cream. It has been around for some time, but only recently has been gaining popularity here in Israel. An article dedicated to the cheese was recently featured in Time Out Tel Aviv and is one of the most popular pizzas at De Peppe Pizzeria, a Delicious Israel favorite. Burrata can be found at specialty cheese shops - including in the Carmel and Machane Yehuda Markets - and is easily identifiable by a blue string tied around it. We recommend incorporating it in your Shavuot dishes this year!